From left: Jeffrey Hamburger, Vivian Spiro, and David Leonard hailed the collaborative exhibition. Art historian Jeffrey Hamburger slowly turns the animal-skin pages of a fragile religious book, his eyes riveted to bold script that chronicles the lives of the early saints. The craftsmanship is spectacular, the presentation vivid and compelling — even though the work is more than 1,000 years old. The Harvard professor handles the book with awed reverence: It is a priceless illuminated manuscript written by a superbly skilled scribe, probably at a Benedictine abbey in central France no later than the year 935. Today, it resides in the well-protected recesses of the Boston Public Library. 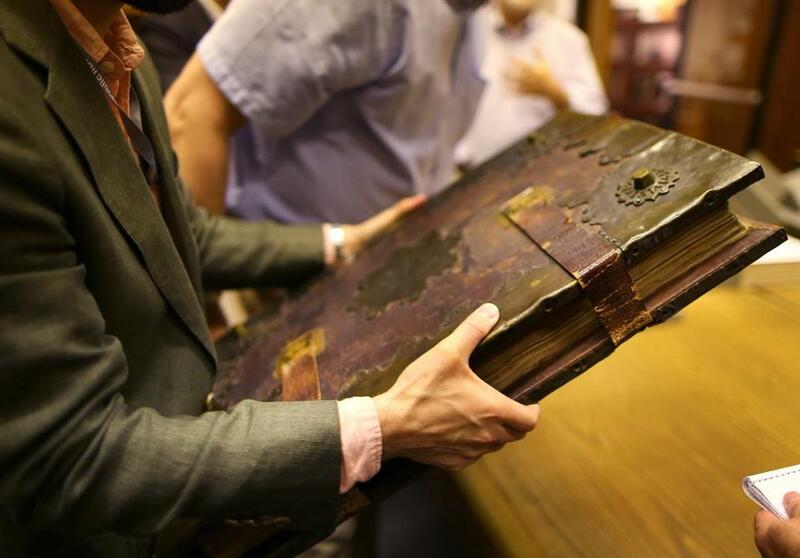 “It’s a piece of buried treasure,” Hamburger said, and one of the oldest books in New England. Viewed in the past mostly by scholars and researchers, the book soon will be presented on a wide, public stage as part of a first-of-its-kind exhibition in Boston of illuminated manuscripts from the Middle Ages and Renaissance. 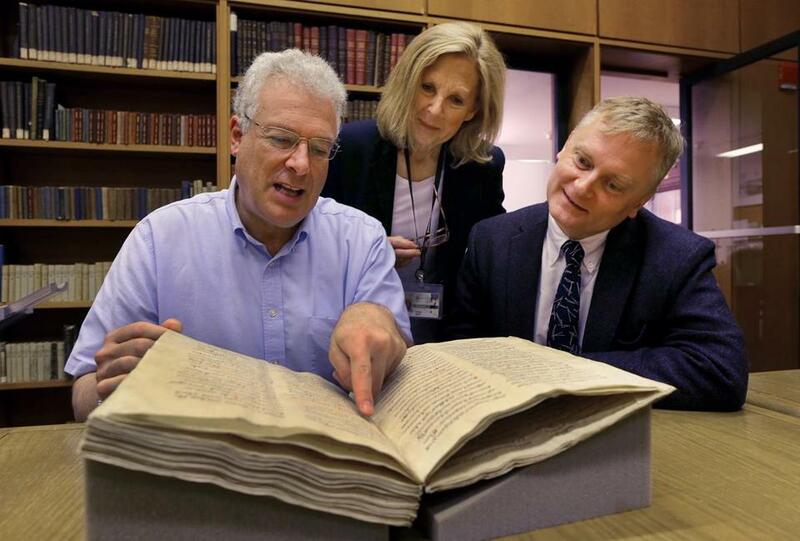 It’s also the culmination of a nearly two-decade quest by Hamburger to showcase Boston’s world-class holdings of the manuscripts, which played a critical role in the preservation and development of Western thought and culture. The exhibition of about 250 pieces, to be held in September, “will easily be the most ambitious exhibition of illuminated manuscripts ever held in North America,” Hamburger said. “The word ‘unprecedented’ has come to mind,” added David Leonard, president of the Boston Public Library. The term “illuminated manuscripts” broadly refers to medieval and Renaissance books with significant decoration, but particularly those with colored pigment or gold leaf. The finest of these in the Boston area, long scattered among academic and cultural institutions, now will be displayed together. “Many of them are in fantastic condition,” Hamburger said. The effort received an important boost from the Associates of the Boston Public Library — an independent organization dedicated to conserving the library’s special and rare collections — which encouraged these institutions to come together to highlight the best of their holdings. A drawing of Saint Jerome dating to the 15th century is part of the exhibition. The exhibition will be mounted under differing themes at Houghton Library at Harvard University, the McMullen Museum of Art at Boston College, and the Isabella Stewart Gardner Museum — all of which are loaning parts of their collections. Items also will come from 15 other local institutions, ranging from the Boston Athenaeum to the Armenian Library and Museum of America. The Houghton Library and the Boston Public Library are the two largest contributors, with 164 and 36 pieces, respectively. Vivian Spiro, chairwoman of the Associates of the Boston Public Library, said the collaboration will redisplay the manuscripts in much the same spirit that the library acquired its items more than a century ago. That rivalry with New York — even on a playing field where the prize was cultural — “was a little bit like the Red Sox and the Yankees,” Hamburger said with a smile. Selecting the exhibits, chosen from about 3,000 works in the Boston area, was a labor of scholarly love that included Hamburger and William Stoneman, curator of early books and manuscripts at the Houghton Library. In the process, objects were uncovered that many researchers might not have known existed. “It was like an iceberg coming up,” Hamburger said. 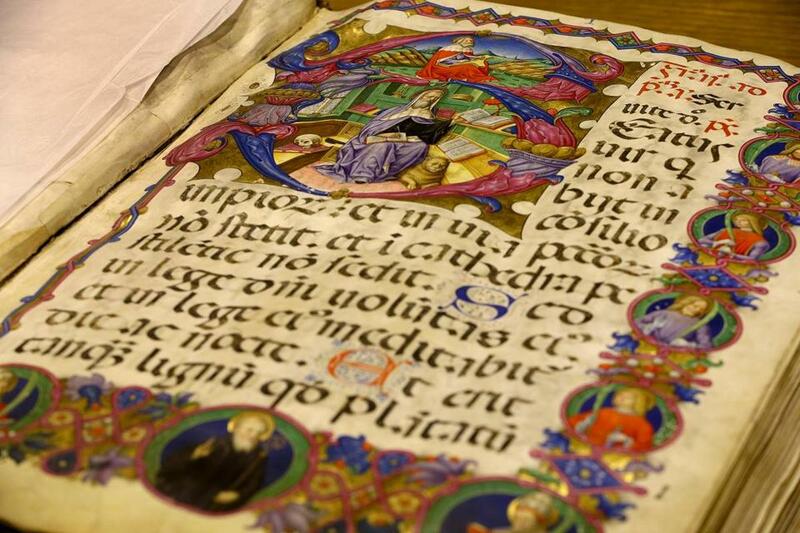 One treasure is an early 12th-century gospel book that has been kept at the Armenian museum in Watertown. Another is a 13th-century psalter, or psalm book, from Flanders, embellished with miniatures in spectacular condition. There also is a large antiphonal book from 15th-century Italy, bound in heavy wooden boards covered with calf’s skin, that was used by monks as they chanted at prayer. “There are a lot of dead animals in that book,” said Stoneman, who added that it would have been a “huge, expensive project” for the time. Measuring about 2 by 3 feet when fully opened, the book is decorated so vividly and precisely that its painting of St. Jerome seems strikingly fresh five centuries later. There is gold leaf, too, as well as smaller, meticulously crafted pictures along the margins. A large leather bound book called an antiphonal book dating to the 15th century was handled in the Boston Public Library’s research room. The exhibitions open Sept. 12 at the Houghton Library and the McMullen Museum and Sept. 22 at the Gardner Museum. Brian MacQuarrie can be reached at brian.macquarrie@globe.com.